Spring mornings don't get much better than this. 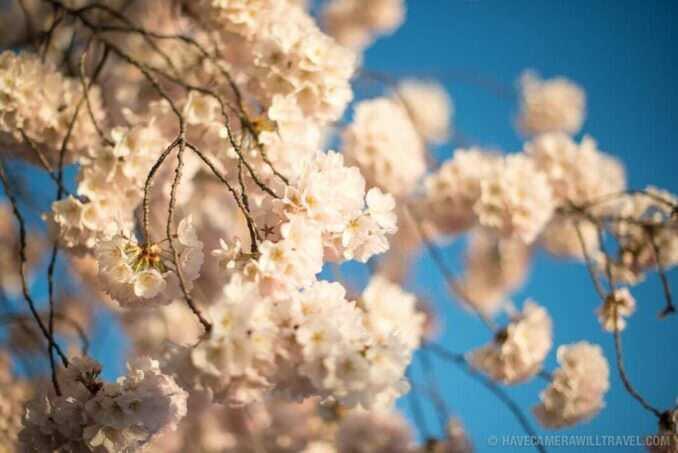 Not a cloud in the sky, clear air, pleasant but cool temperatures, and the cherry blossoms in their prime. The runners of the Cherry Blossom 10-miler had a perfect morning for it. The flowers are holding up very well, and few petals have fallen yet. That's a good sign for the coming couple of days. But they're nevertheless clearly progressing, and if you get up very close you can see some of the individual petals starting to look a little tired. In a few places--scattered for now--green leaves are starting poke through. We're now at peak+2 days. The cherry blossoms are looking stunning, but the clock is ticking and they won't be sticking around for much longer. A day or two more is a reasonably safe bet, but beyond that gets iffy quickly. While there were still quite a lot of photographers and others down to enjoy the sunrise this morning, it wasn't as busy yesterday. The road closures for the Cherry Blossom 10-miler probably had a lot to do with that. But the sunrise was about as good as it gets with a clear sky. There's no way to count the number of people who visited the Tidal Basin yesterday, but it safely qualifies as a lot. Expect the same or even more today. Traffic and parking will be even more complicated because of the road closures this morning. Even when they're lifted late this morning, there'll be a ripple effect for quite a while. Metro and walking will be the best bet for getting to and from. If you have to drive, more detailed information on parking is below. Perhaps. Monday appears to be shaping up very well. As of this morning, the trees are still looking great, and very few petals have fallen. It's a good sign for the next couple of days. My best guess at the moment is that sometime around Tuesday or Wednesday they'll probably start heading out, and that by Thursday and Friday they'll probably mostly be gone. I don't expect there to be much to see next weekend. But there's nothing absolute about this guess, and the trees might well have other ideas. The current weather forecast is for rain on Tuesday. If it's a lot, it might knock some petals off. It's also entirely possible it'll only be light or even doesn't materialize. For a point of reference in recent history, last year the trees bloomed at right around this time. The trees reached peak bloom on a Thursday (April 10). They were looking stunning through a beautiful and warm Saturday and Sunday (you can see photos here). By Monday they were very quickly on their way out, and by Tuesday morning there wasn't much left to see (photos here). If you head down to the National Mall or Tidal Basin it's going to be crowded, period. It will stay that way all through the daylight hours and well into the evening. There's a good reason that many locals wouldn't be caught dead anywhere near downtown this weekend. The Sunday morning road closures are schedule to lift late-morning, but there'll likely be a ripple effect for a while as things get back to "relative" normal. Metro is running regular weekend service today and has stopped any track work for this weekend. More info here and here. Here are some photos from this morning that will give you a sense of the kind of thing you can expect to see if you head down to the Tidal Basin today. Hi! I noticed that it will be so rainy in DC for this week and I just wanna know if I can still see the cherry blossoms if I come this Sunday. 🙂 Your blog is sooooo helpful! Thank youuu!!! I've just posted some photos from this morning with an update that might help. The short version is that it's hard to say for sure since things can change quite a bit in just a day. Thanks for all you updates. We have followed your website everyday, and we visited DC over the weekend. Its very beautiful. We all loved the city and the flowers.. so beautiful..
Glad you enjoyed your visit. And yes, it is a nice place to be. Hi. Thanks for the update. Your website, mainly your photos are so inspiring. I have asked you a couple days if there will still be flowers around by Thursday for that's the only time I could go. Even if there are some flowers left just to take photos with them. Will you still be updating after today? Thank you! I will be doing one or two more updates this week. At this point, my expectation is that they'll be on their way out by Thursday. But because they're not all on precisely the same schedule, there may well be some flowers still to see on some trees. The updates this week should give a sense of what to expect.